The premise: we're a studio audience in the Desilu Playhouse in California and we're watching the filming of two episodes of the original 1950s show. It's a ninety minute one-acter with, unfortunately, no highlights. Euriamis Losada as Ricky Ricardo comes closest. He looks, talks and sings like the original and his Babalu is just terrific, but far too short. 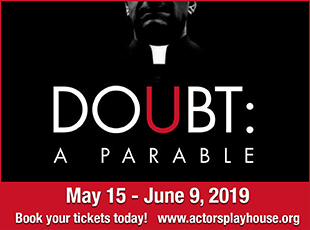 Much less of Mark Christopher Tracy as the Desilu Playhouse host who spends endless minutes on the hokie audience warmups and more on the Losada talent would be aces here. The old singing commercials are fillers for the scene changes and while the singers are okay and move well, these old ads are no more entertaining now than they were then. 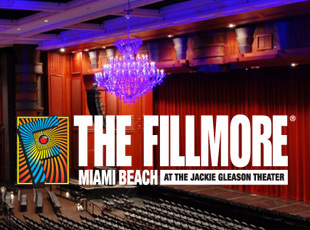 Specialty numbers by the Pleasant Peasants and the Crystaltone Singers are no better than those you'd see in any regional playhouse. Sixty year old material is just that. The novelty has no life span. There's supposed audience participation (shills perhaps?). 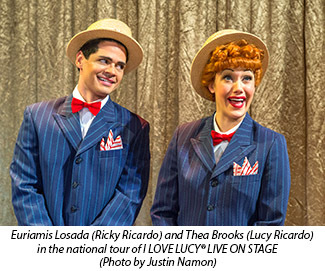 I Love Lucy Live on Stage plays through Oct. 5 at the Arsht Center, 1300 Biscayne Blvd., Miami.